In an historic referendum in June 2016, the people of the United Kingdom voted to leave the European Union. We voted for Brexit. The Leavers have celebrated. The Remainers have had plenty of opportunity to complain about the result. Now, however, it's time we all pulled together to build a successful post-Brexit economy. And this book is a straight-talking, economically-literate and unashamedly patriotic guide to how that success can be achieved. In a nationwide referendum in June 2016, the people of the United Kingdom voted, albeit by a fairly narrow margin, to leave the European Union. Subsequently, the UK government has triggered Article 50 of the Treaty on European Union - formally starting the procedure for withdrawing from the EU. Now, it is fair to say that not everyone in the UK is happy that we are leaving the EU. And whilst the referendum campaigns were in progress, there were a lot of people on the Remain side who predicted that disastrous economic consequences would follow hot on the heels of a victory for the Leave campaign. Some predicted an immediate and devastating recession. Some predicted a financial crisis and a collapse in business confidence. The pro-Remain government at the time warned that an emergency budget - probably with numerous tax hikes and spending cuts - would be necessary. Such dire consequences largely failed to materialise. The doomsayers got it wrong. Not only was there no crisis and no recession, but growth rates were soon being revised upwards, unemployment continued to fall and the stock market soon hit record levels. The economy appeared to be not just resilient, but remarkably buoyant. But, of course, we haven't actually left the EU yet - so the decision to leave the EU could, of course, still turn out badly in the end. And some UK 'Remain' politicians and their supporters still seem to think it will. They still seem to view the referendum result as nothing less than a disaster - one that will inevitably turn out very badly for us, in terms of our future economic performance. Well, what I say is this: I can't be certain that the UK will make a success of Brexit, but no matter what the doomsayers claim, failure is not inevitable - and I wish those doomsayers would stop talking as if it is. It sometimes seems as if some of them actually want the UK economy to fail, just so they can claim to have been right all along. But the truth of the situation is this: Whilst Brexit will inevitably bring difficulties of various kinds, it also brings great opportunities. Not only can Britain avoid any sort of collapse. With some careful thought and the right attitude, we can thrive. If we have confidence in ourselves and if we use our brains, the UK, post-Brexit, can be a successful economy. It can, if we put our minds to it, be much more successful outside the EU, than it ever was inside the EU. And whichever side you backed in the referendum, if you are a patriotic Brit, you should want the UK to be successful and you should want to do your bit to help make it successful. 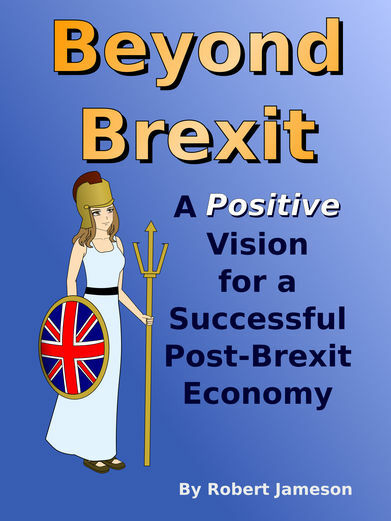 And this book sets out a case for how that success can be achieved - a positive, economically-literate vision for a successful post-Brexit economy. Whether you voted to leave or voted to remain, if you want to see a more successful and more prosperous United Kingdom, please read this book to see how that goal can be achieved. We are the greatest country in the history of the world. And we're not finished yet! Let's show the world what we're made of! Before we examine the opportunities of Brexit and possible formulas for future economic success, I ask you to consider a simple question: How successful, economically, do you think we've been up until now? What I mean is: In many respects, we've certainly come a very long way since the beginnings of modern civilisation. Over the centuries, we've widened our knowledge, developed new technologies and learnt how to organise ourselves more effectively - so that, with modern production techniques, our productive capabilities are exponentially greater than they were just a few centuries ago. We are more than capable of providing for our essential needs, whilst also providing a veritable bounty of luxuries as well. But how much scope, approximately, do we still have for further improvement? In the grand scheme of things, just what sort of efficiency level do you think we are running at? In other words, if we made optimal use of our resources and of the technology currently available to us and didn't waste any of our resources or potential at all, we might be said to be operating at 100% efficiency. Obviously, we aren't anywhere near perfect and we don't make optimum use of our resources and technology - but how close are we to the theoretical 100% efficiency? It would be difficult to come up with a precise and definitive answer, but in order to make a reasonable estimate, I suggest merely trying to be a reasonable observer of the world around you. Look at the cars on the road. Look at one hundred cars going past and notice how many of them have only one person in them. It may be that those one hundred cars are doing a job that could easily be done by just 30 or 40 cars. And how many of those journeys could be avoided altogether if only people had been able to get an affordable house or apartment near their place of work? Look at how many delivery vehicles from all sorts of different companies visit a typical street in one day. Perhaps a dozen or more vans, each with their own driver, perform a task that could have been performed by just one van and one driver. Look at all the hundreds of thousands of houses left unoccupied, despite there being millions of people who would love to have a house of their own to make use of. Observe a typical manager or administrator in an office - whether it be in the private sector or in the public sector. How much of their time is spent on genuinely important decision-making tasks - and how much of it is spent producing largely pointless spreadsheets or reports or notices, just to impress their boss or simply to try to make it look as if they are busy? How much of their time is wasted because of their unreliable computer system? How much of their time is wasted because they don't know how to use their computer properly? How much of their time is wasted on proving their compliance with unnecessarily bureaucratic regulatory requirements? There's a little row of ten houses - and in each one of them, someone is preparing an evening meal for the household. That's ten people, in ten kitchens, with ten sets of hobs, performing a task that could have been completed by just one of them, using far less energy, a single cooker and a single set of slightly larger saucepans. Tens of millions of people in the UK own smartphones - often very expensive smartphones that they replace every two years or so. Is that really an effective use of scarce resources? Millions of people spend hours each day mindlessly fiddling on their smartphones. Is that an efficient use of their time? Thirty children sit in a class - but during their hour-long lesson, how much do they really learn? How much of the lesson is wasted because of the disruptive behaviour of a few poorly-behaved children who continually disrupt the lesson? How much potential learning is lost, because the classroom is simply too noisy for the students to be able to concentrate properly? An economist, you see, considers the issue of efficiency, not in terms of money, but in terms of real resources and in terms of how people's time is being wasted unnecessarily. And if you learn to see the world through an economist's eyes, you see gross inefficiency nearly everywhere you look. In truth, our efficiency level, as a society, is nowhere near 100%, or 90% or 80%. It's nowhere near 50%. Indeed, I suggest that it would be wildly optimistic to suggest it is anywhere close to 10%. It's probably not even 5% and it's possibly a lot lower than that. And I'm not just talking about the UK here. Most other countries are just as bad or worse. In the grand, centuries-long quest to become efficient, we are barely out of the starting blocks. But do not despair - because this is not bad news. Indeed, this is, in a sense, extremely good news, because what this means is that, economically speaking, we have a huge amount of unexplored potential. If we can exploit any reasonable fraction of that so far unused potential, we can have success the likes of which we barely even dare to dream of. And guess what? Our capacity to unlock that potential is not, in any substantial sense, dependent on us continuing to be members of the European Union. Also available in Apple's iBookstore, in the Kobo and Nook stores, from Google Play Books and at Scribd. To find out how else you can support our work, please visit our About IMOS page.